In this case, the ‘Marconi Bros AG’ project was moved from a Media Composer to an Xpress machine. Since the move only the ‘Sequences A’ and ‘Takes’ bins have meed modified – therefore only they have been backed up to the Avid Attic. This means that you can go back to earlier versions of some of your project without losing recent changes to the rest of your project. To recover older versions of bins, you have two options, depending on if you want to completely revert to the way the bin was, or if you need to access a clip or sequence in the backup while keeping the bin as it is. To replace the bin with a backup, rename the filename extension from ‘.n’ to ‘.avb’ and replace the current file in the project folder. To have access to both the current and older version of the bin, you need to rename the backup bin with a different name as well as change the extension to ‘.avb’ – then copy the bin file to your project file. 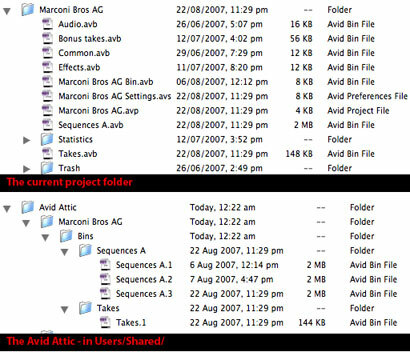 Due to a bug in some versions of Avid (including Media Composer), it isn’t possible to have both the current and backup version of a bin open at the same time in Avid. Even if you have renamed the backup bin, Avid can’t display the contents of both bins at the same time. To get around this you can have the window of the backup bin open and drag the clips and sequences you want to the icon of the unopened current version of the bin. Once you close the window of the bin copied from the Attic, you can open the current version of the bin and continue to work. 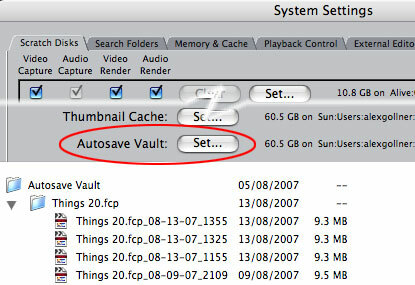 As Avid only autosaves the bins that have changed in your project, you should also have a policy of backing up the other files and folders kept in the project folder to a backup drive (not the media drive).